Great solution for advanced spike/burst analysis. Mobius Offline Toolkit is an analysis package for data collected with MED64 Mobius. The software allows MED64 users to quickly perform neuronal burst activity and Fast Fourier Transform (FFT) analysis for data recorded with Mobius. Display neuronal spikes with Raster Plots. Detect array-wide spiking as a “Synchronized burst”. 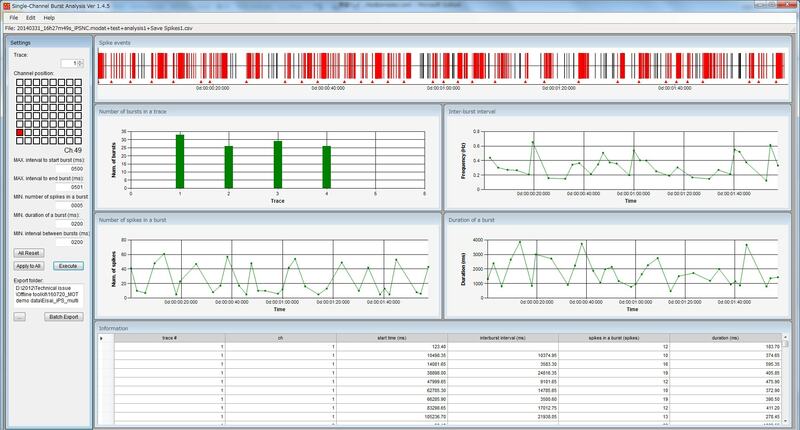 Extract detailed information from synchronized bursts, such as burst duration, intervals, onset time and number of spikes in a burst. Read “Time Stamp” data recorded and exported with Mobius. Export all analysis results to .csv files. Synchronized burst analysis. Raster plot for spike timestamps are displayed on the top-right. Synchronized bursts are displayed in the black bars (red arrow in the middle of the Raster plot chart) and their information is provided in the charts (bottom). 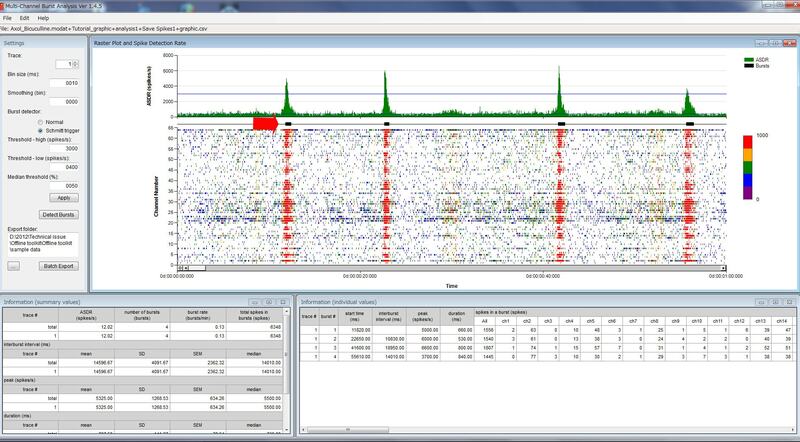 Detect a set of high-frequency spikes in a channel as a “Burst” and perform several different analyses. Spike Time Stamp data and detected bursts are displayed. Extract burst information such as duration, interval, onset time, number of bursts, number of spikes per burst. Single burst analysis. Time course of spike time stamps are displayed (top). Red shows “busts” extracted. The information for the “bursts” are displayed graphically (middle) and as a table (bottom). Perform a Fast Fourier Transform (FFT) of raw data recorded by Mobius software. Transforms a complex voltage signal in the time domain into the component sine waves that compose the raw signal in the frequency domain. Generates Power Spectrum Density (PSD) and Spectrogram charts. Power Spectrum Density chart (left) and Spectrogram chart (right). Contact us to get the software!